Swedish Government’s Attempt to Deport Peyman Najafi Halted; All Hands on Deck for Navid Mirpourzadih! Iranian activist Peyman Najafi’s deportation order was cancelled today at the last minute, on the day he was to be forcibly boarded on a flight to Tehran. We extend thanks & gratitude to each and every person who called, faxed, emailed and otherwise supported the call to stop Peyman’s deportation. We especially thank Andisheh Alishahi of the International Federation of Iranian Refugees for all of her hard work on the ground. And we thank Pascal Yasmina, Stéphane Julien and all of the French activists who helped us pass a decisive milestone in our struggle for a humane world. When the French union CGT stood to support Peyman Najafi and Navid Mirpourzadeh, it demonstrated that we are not the only ones who believe that the attack against the rights of refugees is an attack against society in general and in its totality; and in our barricades to defend our humane rights, we too need the unity and solidarity of our sisters and brothers worldwide. 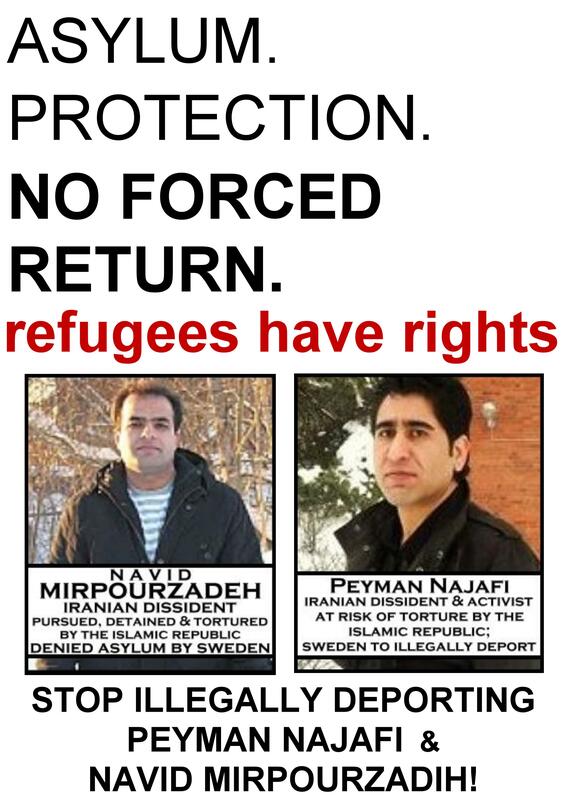 This has made a qualitative difference in the struggle both for Peyman and Navid, and for the larger struggle for asylum-seekers’ rights as well. We must now rally together again to stop the deportation of our own Navid Mirpourzadih, Mission Free Iran’s coordinator for refugee issues in Sweden. Sweden intends to deport him on Friday, 19 August 2011. We will not allow this crime to take place. We call again on all honorable people in Sweden and worldwide to join hands and prevent Sweden from committing the crime of deporting Navid to Iran. You can find all of our materials on Navid’s personal story and actions you can take to help stop his deportation here.